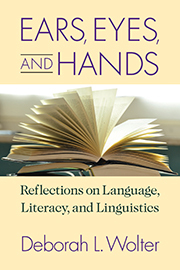 Ears, Eyes, and Hands presents the author’s reflections on language, literacy, and linguistics that have been shaped by her deafness and by her work as an educator. In short, engaging narratives, Deborah L. Wolter exposes deeply entrenched attitudes and stereotypes regarding language, bringing to bear her own experiences as a deaf person as well as her interactions with children from varying backgrounds. Wolter reveals and rectifies the impact of deficit mindsets in the educational system regarding race, ethnicity, economic status, gender, and disability. As a literacy specialist, she works with students who fall through the cracks in a system that strives to embrace the diverse backgrounds and abilities found in the classroom. Her passion for engaging students and cultivating literacy shines in the stories she tells, which serve as parables that allow readers to evaluate their own attitudes and assumptions. Educators, parents, and community members will benefit from Wolter’s examination of sociolinguistics and language privilege as she identifies how ethnocentrism and ableism are contributing to negative educational outcomes for some students. With humor and warmth, she offers a path toward approaching language and listening as a gateway to connection and understanding, both inside the classroom and beyond. Deborah L. Wolter is a literacy consultant for Student Intervention and Support Services in the Ann Arbor Public Schools in Michigan.